UK CPI Inflation remained at 4.5% for the month of May at more than twice the Bank of England's 2% target that continues to make a mockery of the central bank who's primary remit is supposedly price stability, where 3% is supposed to be the maximum level a break of which was supposedly to trigger panic responses to bring inflation under control, instead of which the Bank of England has instead opted to pump out temporarily high inflation propaganda for the past 18 months. Meanwhile the more recognised RPI Inflation measure nudged higher to 5.2% which is set against average pay rises of just 2%. UK CPI inflation looks destined to hit 5% within a few short months especially as energy companies continue to milk customers with outrageous unjustifiable price hikes of as much as 20%, all conducted in an environment of record low interest rates, now held at 0.5% for more than 2 years, all as a consequence of the Bank of England's primary focus in ensuring that the still bankrupt banking sector continues to generate artificial profits that are only partially being used to write down bad debts, with the balance paid out as bonuses on what amount to fictitious tax payer funded profits. 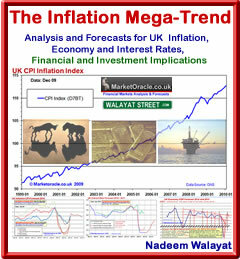 The recent (March 2011) 85 page Interest Mega-Trend Ebook (FREE DOWNLOAD), concluded in expectations for just 1 or 2 token UK rate hikes with the first rate rise forecast to occur in June / July 2011, and longer term expectations for UK interest rates to hit a minimum of 4.5% by the end of 2014 as debt to GDP continues to explode higher despite the propaganda of austerity cuts that in reality will make little impact on the governments budget deficit. Britain's public debt trajectory remains as last analysed in June 2010 (UK ConLib Government to Use INFLATION Stealth Tax to Erode Value of Public Debt ) with Coalition government making no real difference against what would take place under a Labour government, which is for a 50% rise in public debt on 2009-2010 by 2013-14. The updated in-depth analysis and forecast for UK inflation for 2011 (17 Jan 2011 - UK Inflation Forecast 2011, Imminent Spike to Above CPI 4%, RPI 6% ) concluded in UK inflation spiking to a high of 4.2% early 2011, and thereafter trend lower towards 3% by the end of 2011 and therefore remaining above the Bank of England's 3% upper limit for the whole of 2011. The May Bank of England Inflation Report revised UK CPI forecast to 4% by the end of 2011 which represents a sizable jump from the preceding report of 1.7% by the end of 2011. The reality of Britain's inflation situation is that the only thing that will prompt the Bank of England to change its policy of stealth debt default by means of high inflation is if the workers of Britain rebel against persistently high inflation by igniting the wage price spiral for which there is little sign of at this point in time. The British population has been successfully fooled by economic smoke and mirrors into bailing out the bankster's at unlimited liability so that no bankster generated bad debts have been defaulted upon, every bond issued by the bankster's that they have collected bonuses upon is being honoured by the tax payers of Britain at huge personal cost that will continue to be born for the next decade. The primary mechanism for this stealth theft of wealth is by means of high real inflation induced loss of purchasing power of earnings that has been effectively masked from the public who are increasingly experiencing the real pain of not being able to maintain their standards of living without triggering angry public demonstrations such as those that take place on a near weekly basis in Greece against pay cuts as Greece being part of the Euro-zone is unable to print money and inflate but rather wait for the German bankster's to make loans available to finance the Greek government deficit in exchange for the asset stripping of Greece in lieu of debt that they are not being allowed to default upon due to exposure of German and French banks to Greek debt. The workers of Britain are in the exact same boat as the workers of Greece, it's just that for the Greeks the theft is far more obvious since they actually see their pay being cut, whereas in Britain the theft is executed stealthily, slyly by the masters of economic propaganda such as Mervyn King uttering soothing phrases every now and then of temporarily high inflation that the mainstream press and academic economists (vested interests) lap up and regurgitate at length so as to manage the populations inflation expectations. The stealth theft of wealth also continues for savers where even the best current instant access savings account paying 3% is still resulting in a loss of life time accumulated wealth to a value of 2.8% per year (RPI and after basic income tax). For savers to just break even they would need to be in receipt of savings rates of at least 6.2%. Savers you have been fooled, fooled into believing that bailing out the banks was to protect your savings. Instead you have lost at least 10% of the value of your savings to date, your savings are effectively subsidised cash for the banks to gamble with without risk of loss as they know the tax payer will always step in to bail them out. The Governor of the Bank of England, Mervyn King himself has just been rewarded with a Knighthood by the Queen for exactly what ? Ensuring the general population remain clueless heavily taxed debt slaves to the bankster elite ? Instead every tax payer in Britain should receive a Knighthood for they are infinitely more deserving than Mervyn King who's only task appears to be is to send a letter of apology to the Chancellor for failing to control inflation! For 50 pages of wealth protection strategies see the 100 page Inflation Mega-Trend ebook (FREE DOWNLOAD). could you please shed some light on Pound direction versus dollar. As I have built up large position. Thank you. you are the Best out there! BOE announced that they open possibilities of more quantitative easing, and UK economic indicator seems going lower. Do you think still there's a possibility of rate hike in July?